The Indian Marsh Crocodile (Crocodylus palustris), also called as the Mugger is one of three species of crocodiles found in India, the others being the Gharial and the Saltwater crocodile. This crocodile is found in lakes, rivers and marshes. They prefer slow-moving, shallower bodies of water rather than, fast-flowing, deep areas. It has some tolerance to saltwater therefore is occasionally reported from saltwater lagoons. It is known to be more mobile on land, can migrate considerable distances over land in search of a more suitable habitat. It can chase prey on land for short distances. It eats fish, other reptiles and small mammals, such as monkeys. Most vertebrates that approach the water to drink are potential prey, and may be seized and dragged into the water to be drowned and devoured at leisure. Large adults will sometimes prey on large mammals such as deer and domestic water buffalo. At night they sometimes hunt on land, lying in ambush near forest trails. 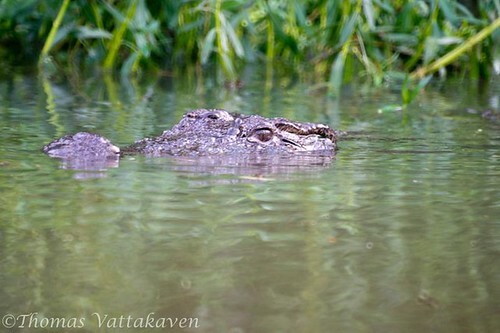 This species is generally considered to be occasionally dangerous to humans, but not as much as the much larger and less common saltwater crocodile. 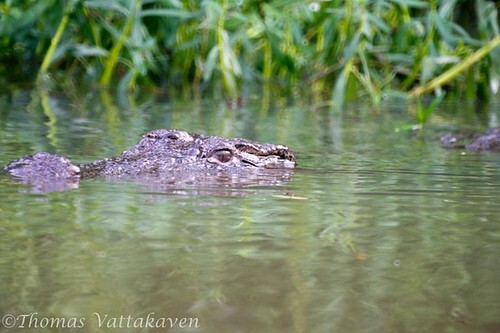 I took these photographs while on a boat ride inside Ranganathittu bird sanctuary. We were told that they are too busy feeding on fish there that they never bother with humans. Yet it is quite a thrill to ride crocodile infested waters on a rowing boat! I was so engrossed in taking pictures of the birds that I actually couldn't give much attention to the crocodile! When I finally did have a chance to take some good pics, my card had run out of space!